2 channel, 18 bit, 40 MS/sec, high speed, low noise, low cost, wide frequency band, 2 parametric inputs AE PCI card. Ideal for research and applications where high speed, low noise, low cost, high resolution wide frequency band are required. In 1995, PAC introduced 16-bit 20 MHz A/D for AE. Now with the PCI-2, we are introducing our 18-bit 40 MSamples/sec A/D for Lower Noise & Higher Speed. The PCI-2 AE System on a card is a 2-channel data acquisition and digital signal processing system on a single full-size 32-bit PCI-Card, ready for operation in your PC or one of PAC’s “hardened” PC’s (for multiple channel operation). 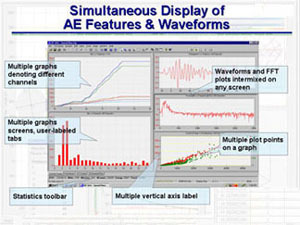 Simultaneous Display of AE Featuers Superior low noise and low threshold performance has been achieved with this revolutionary AE system design, through the use of a PAC designed 18-bit A/D conversion scheme, 40 MSample/second acquisition and real time sample averaging techniques. This performance has been achieved via pipelined, real time architecture, without any sacrifice in AE performance. With these features and its very low cost, the PCI-2 is ideal for laboratories, universities and industrial turnkey systems, and any application where low noise, low channel count and low cost are required, as well as where the use of an existing PC is desired. Through the high-performance PCI (Peripheral Component Interconnect) bus and Direct Memory Access (DMA) architecture, significant AE data transfer speeds can be attained, assuring a wide bandwidth bus for multi-channel AE data acquisition and waveform transfer. In addition to two AE channels, the system also has two parametric channels for other transducers, such as strain gage, pressure, temperature, load and more. Ask PAC for our latest performance tests. Waveform data streaming capability is built within the board, allowing waveforms to be continuously transferred to the hard disk. The 32-bit PCI bus is the de-facto standard in all PC computers being shipped today. PCI-2 AE System cards can be implemented inside most standard PC computers or inside one of PAC’s rugged, multi-channel PAC system chassis, including the 8-channel benchtop chassis and a 4-channel notebook based chassis (µ-series). Noesis 3.3 ScreenshotDue to advances in surface mount technology and high density ASIC (high density Programmable Gate Arrays) devices, PAC has been able to provide this single AE System on a board with 2 complete high-speed AE channels of real time AE data acquisition, with real time feature extraction, waveform processing and transfer, 2 analog parametric input channels and 8 digital input and output control signals. Front Panel activity lights are totally under the control of your PC to provide status on AE data as well as to give you indication of any malfunctioning of your system. Audio AE Interface that is ready for “high fidelity” listening with your PAC PCI-Audio Card. Auto Sensor testing standard with all PAC systems for easy system/sensor self calibration and interface coupling efficiency monitoring. 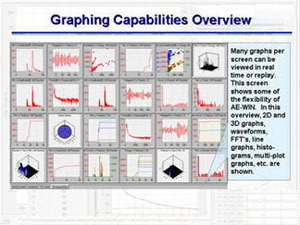 Standard 18-bit PCI hardware and 32-bit Windows AEwin™ software allows the customer maximum flexibility of using a PC or a notebook computer. No need to change “home made” PC’s, but ability to take advantage of today’s PC speeds readily available with high performance PCI busses. Multiple AE channels (up to 8) are easily synchronized for multiple location algorithms. Very low noise, low cost, 2 channel complete, AE system on a card, with waveform and hit processing built-in, on one full size, industry standard, 32-bit PCI card. Internal 18-bit A/D conversion and processing for better resolution (less than 1 dB) at very low signal amplitudes, and low threshold settings, providing superior low noise performance. 40 MHz, 18-bit A/D conversion with real time sample averaging (2x or 4x) to provide enhanced accuracy beyond any existing AE system on the market. Built-in, real time AE feature extraction and DMA transfer on each channel for high speed transient data analysis at high hit rates directly to the Hard Disk (HD). 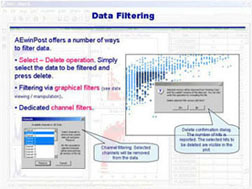 Built-in waveform processing with independent DMA transfer on each channel for high speed waveform transfer and processing. AE Data Streaming is also built into the PCI-2 board allowing continuous recording of AE waveforms to the hard disk at up to 10 MSamples/sec rate (on one channel, 5 MSamples/ second on 2 AE channels). 4 High Pass and 6 Low Pass filter selections for each channel, totally under software control. Up to 2 parametrics on each PCI-2 board with 16-bit A/D converter and update rates up to 100 readings/ second. The first parametric is a full “Instrumentation conditioning channel” providing signal conditioning including gain control, offset control and filtering options for direct sensor input (e.g. strain gage inputs). The second provides a straight +/- 10 volt input for conditioned sensor outputs. Designed with extremely high density FPGA’s and ASIC IC’s, to provide extreme high performance and minimize components and cost. Hit LED, and Audio drivers are built within the PCI-2 board so that LED’s can be attached directly and sound can be processed via the PAC PCI-Audio Card (option). Digital signal processing circuitry virtually eliminates drift, thereby achieving high accuracy and reliability. PCI-2 is supported by PAC Windows Platform of PACwin™ Suite, a PAC Windows platform consisting of AEwinTM, AEwinPostTM and NoesisTM. 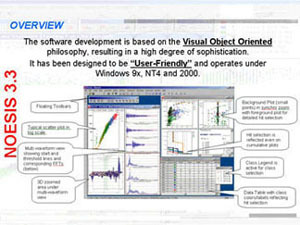 All software runs in Windows 98, ME (Millennium Edition), 2000 and XP, thus taking advantage of standard features such as multi-tasking, graphic user interfaces, etc. and providing the ability to change AE parameters during test operation. Multiple location algorithms are available including linear, planar, tank bottom, cylindrical, spherical (with ASME weld zones), 3-D, advanced Non-Linear Regression (NLR) location, and over-determined planar location for exceptional accuracy. All location algorithms utilize attenuation tables/curves, auto-sensor placement, and source corrected amplitude for more accurate location and AE intensity calculation.